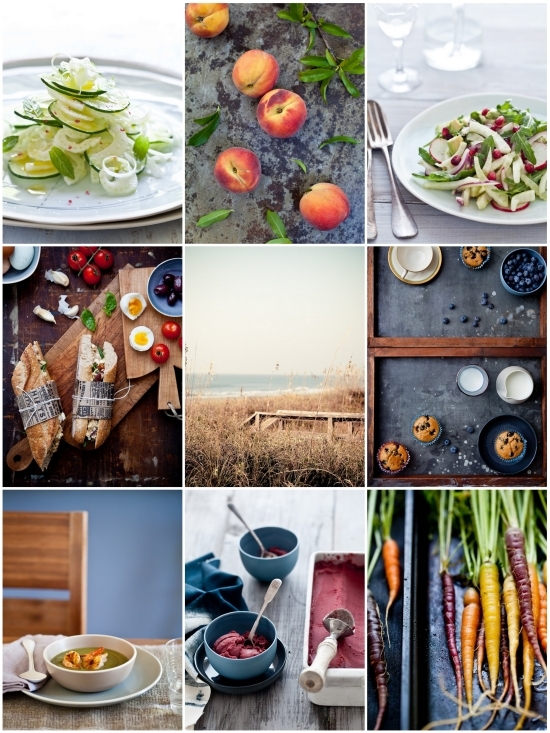 Announcing a Four Day Gourmet Cooking - Food Styling and Photography May 13th-May 17th In Myrtle Beach, South Carolina! I am really excited to announce that I am teaming up again with my dear friend John Ondo, Chef at Lana restaurant in Charleston, South Carolina for a 4 day workshop in Myrtle Beach, South Carolina, May 13th-17th 2014, combining cooking classes and photo/styling....! I have known John for many years and have photographed him and his crew many times. His food, cooking, restaurant are like home to us. He's incredibly talented, down to earth and a great teacher. We had such a great time teaching our last workshop together that we decided to do another one. We wanted to bring a workshop that was not only full of information but relaxing at the same time and we are always thinking the beach is about as relaxing as one can get! Students will get to spend time with John work his craft in the kitchen through various small group cooking classes covering lots and lots of different ingredients and dishes (gnocchi, lamb, cast iron cooking...) Through both our personal guidance, attendees will develop their own creative process for styling, shooting and editing their photographic stories. Throughout the workshop, I will take the group through studio/home as well as on location shoot, be it a bakery or a restaurant, a food focus event, etc... 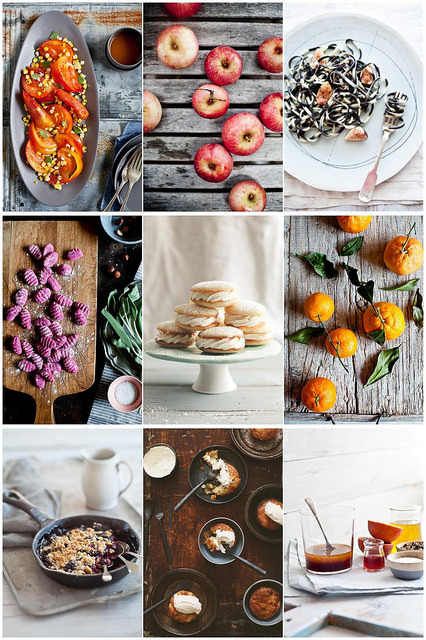 I am an open book, so any question you have about photography for blogging, editorial or cookbook will be answered. There will also be an open session for you to ask me anything you want about the business, or how to get started in the field. I will share with you my experiences and tips on who to connect with, how to approach potential clients, or just how to best submit your blog for recipe development and photographing for brands. John and I will share with you the tips and hindsight we both gleaned from being the one in front or behind the camera and how to best approach light, time and space constraints. Nothing is off limits with questions, from how to pick ingredients and how to cook them, how to manage your cooking/photo time efficiently, knowing about photography for blogging, cooking for photography, photo as a hobby or how to get started in the business. Both John and myself will be 100% available to all your questions. While we are in the gorgeous setting of the South Carolina coast. Where: Beautiful house in Myrtle Beach, South Carolina. More details about the house here and a video here. 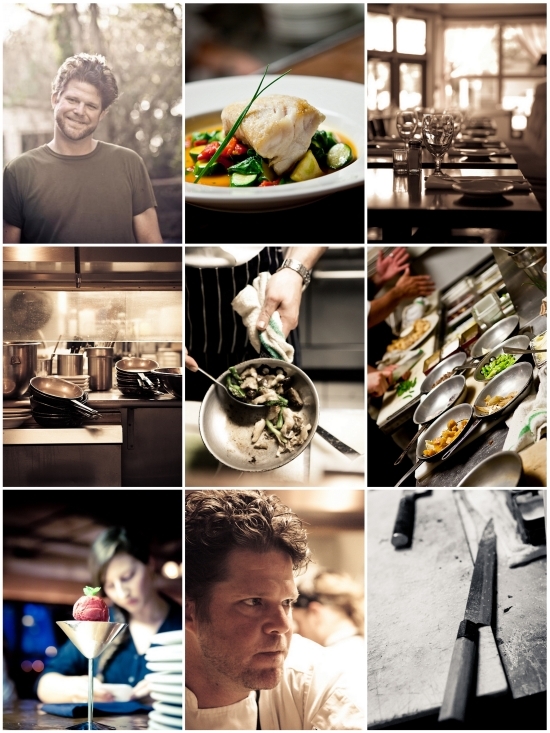 3 days of technical and practical instruction with cooking, food styling, composition, prop styling and photo sessions . Reception cocktails and appetizers on the evening of the 13th. Snack, refreshments, happy hour, etc.. There will be no refunds for this workshop – please know you attend before registering. The workshop is open to 13 people. Registration is NOW open! To register please visit here. This winter in Alabama has been quite different than all other winters I have spent in the South so far. Colder and lingering on. After the ice and snow that paralysed the Southern states just a couple of weeks ago, we had another snow episode just last week. This one was quite different though. It snowed on warmer grounds for a few hours and by 10pm, our streets were covered with the most beautiful blanket of fluffy snow. By 10am the next morning, it was all gone. The evening it was snowing, one big snowflake at a time, I took the old pup and the camera and ventured outside. I was sure I'd be the only one out there. But, in that perfect quietness that happens after a snow fall, where all sounds become muted, where you feel that almost undefinable peace in your soul, I started hearing soft voices emerging all around me. Within minutes, our street became alive with neighbors, kids and dogs. Our neighborhood is full of creatives and I was not surprised to see many polaroids, brownie and diana cameras as well as high tech ones and cell phones. You could tell we don't see snow very often! I was among them snapping away, instagramming and sending shots to family and friends. As I could hear my feet onto the freshly fallen powder my mind wandered... Yep. While others were pondering snow angels at almost midnight, I was thinking about another kind of frozen fun. The edible kind. I started thinking about silky smooth whipped cream dessert, ice creams, snow cones, slushies, frozen drinks and granitas. 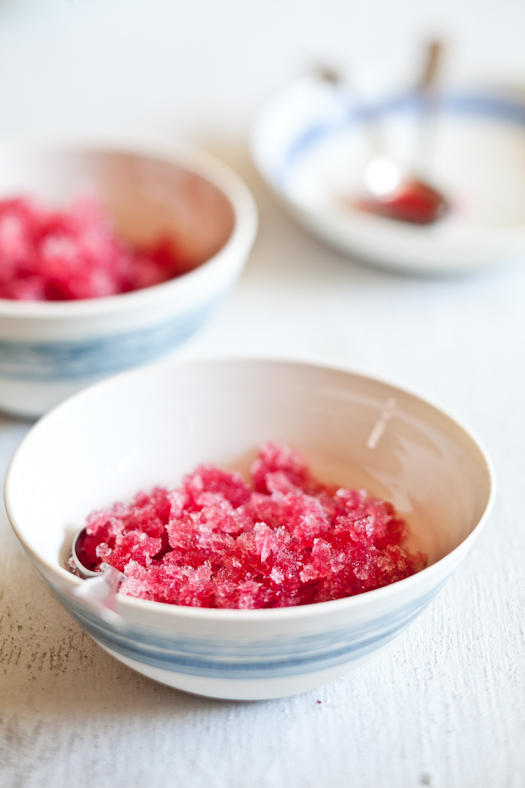 The next day after work, I picked up a whole bunch of blood oranges to make granita. 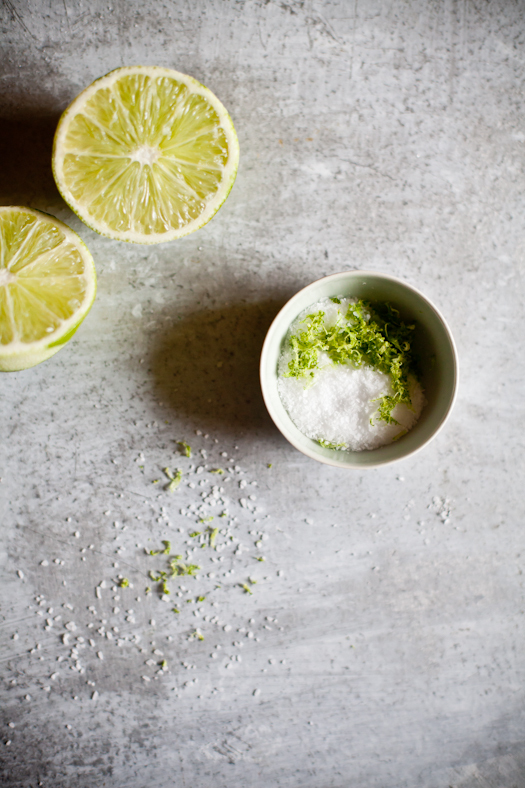 I added a bit of tequila, quite a bit of lime juice and a tad bit of salt and pink pepper flakes for a little kick. 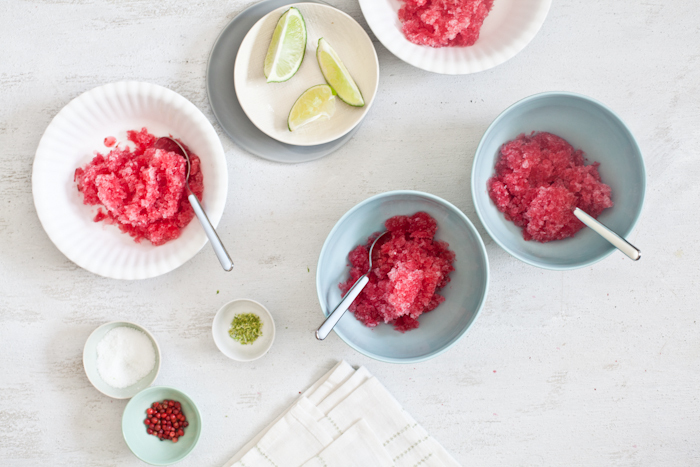 The beauty of this granita is that you can make it without the alcohol for a kid friendly treat or take it a step further and turn it into a frozen margarita for an adult cocktail between friends. I admit, I also really wanted to try the new citrus juicer attachment on the new food processor the folks at Magimix by Robot-Coupe had sent me over Christmas. That thing is impressive. No more arm feeling like it's about to fall off after juicing many pounds of citrus for juices, cakes and marmalades. I am addicted. There's something about blood oranges that make me eat them non stop when they are in season while I don't really bother with regular ones any other time. They are so much more fragrant, beautiful to look at and marry themselves equally well with lots of savory dishes. Yes, I am a sucker for cold desserts on cold days. Makes me rush to the fireplace. There's no logic to my logic except that it was delicious and well worth the bit of prep involved. Ok, I confess, I still enjoyed it all weekend long even with the temperature coming back up in higher ranges. 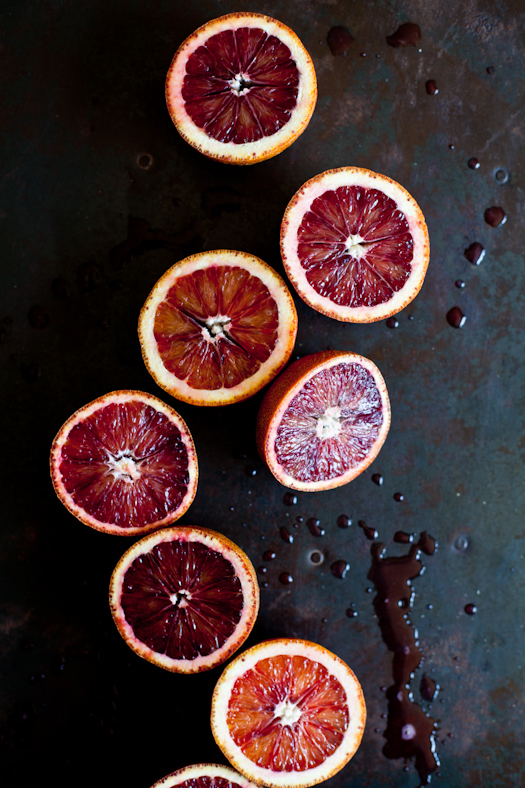 Blood oranges just make me swoon.